Huwa-San is the new generation of biodegradable disinfection. The Huwa-San products are ecological disinfectants based on activated and stabilised hydrogen peroxide. The unique way of activating and stabilising is proven highly effective, f.i. in legionella control and removal of biofilm. 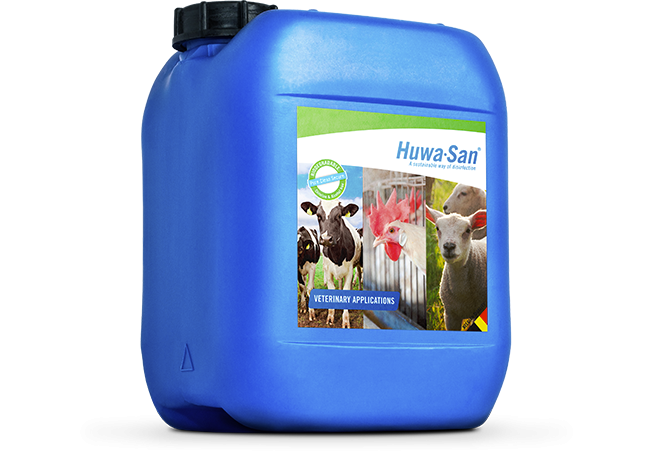 Huwa-San is a safe, odourless, alcohol-free and eco-friendly disinfectant solution for applications in the Veterinary industry and even for (drinking) water disinfecting. What does our product do? Huwa-San disinfection is a very safe and effective method for removing the risk of most parasites, bacteria, fungi and viruses and can be used for infection control, algae growth prevention and biofilm removal as well as for conditioning rinsing and washing waters. Using Huwa San to provide a sterile drinking-water supply to animals encourages growth, reduces stress and allows the development of healthy animals. Sterile water also allows vitamins and medicines to be delivered easily, and ensures that there is no possibility of ingress for pathogens and viruses that could increase mortality. Huwa-San 50 VET is suitable for killing bacteria, fungi, viruses, spores. 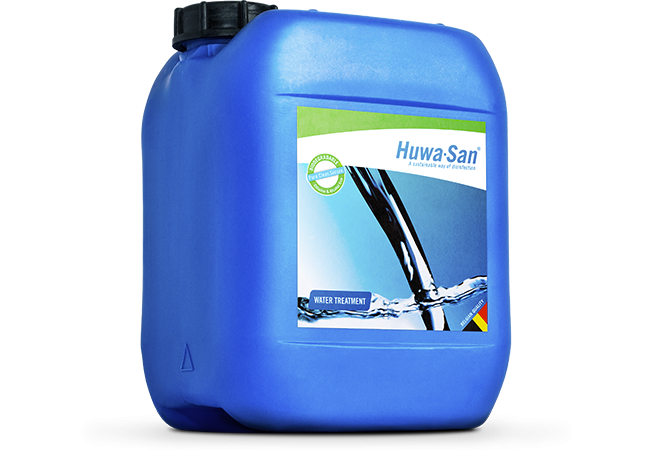 Huwa-San WATER products can be used to disinfect your entire water system, to remove biofilm and to prevent Legionella. Huwa-San Water is a biodegradable alternative to existing products on the basis of halogens, chlorine, bromine, iodine, aldehydes, quaternary ammonium compounds. 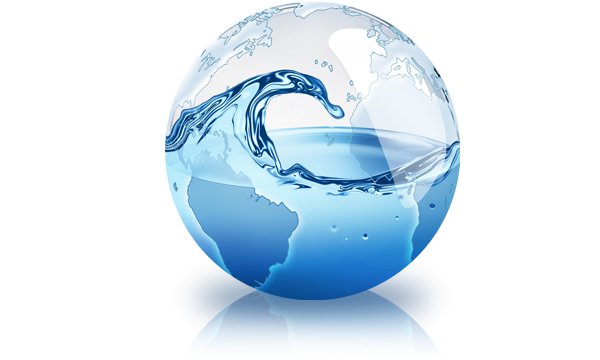 Drinking water suppliers (public and private), food and beverage industry, sewage and waste water treatment plants and fish farms. Huwa-San 50 WT is a disinfectant used for the sanitation of drinking water and the cleaning of water systems. Some applications are: irrigation water disinfection, biofilm removal in water systems, process water, sewage and waste water treatment. Even ponds, fountains and fish tanks are treated with Huwa-San 50 WT. Huwa-San 50 WT is suitable to kill bacteria, fungi, viruses, spores, algae and amoebae.